Kinnikinnick is a widespread circumpolar submontane to subalpine shrub species (Klinka et al. 1989). In North America, it is found from California north to Alaska, across Canada and the northern US, and throughout the Rocky Mountains from Canada to New Mexico (Crane 1991). In British Columbia, it is found across the province in "dry forests and exposed, often rocky, sites in the lowland to lower alpine zones" (Douglas et al. 1999). It is frequently a dominant understory species in open pine forests where it grows best in high light situations (but will sometimes tolerate shade) (Crane 1999). Klinka et al. (1998) indicate that in coastal BC it is "common in open-canopy, young, ­seral lodgepole pine forests on shallow soils, soils on rock outcrops and strongly drained coarse-skeletal soils on water­shedding sites". It is a fire-tolerant species (short fire cycles, low fuel buildup) and may be a "seedbanking species with fire resistant seed" (Crane 1999). 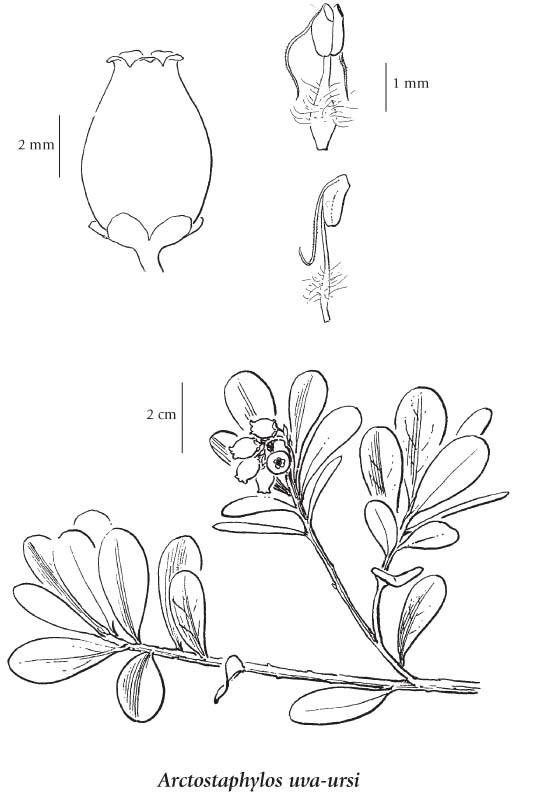 This common BC species is an evergreen prostrate shrub species with leathery dark green leaves that produces trailing stems and can form broad mats. Flowers are pink and bell-shaped; fruits are bright red 'berries' (drupes). Roots on dry sites are reported up to 181 cm (Crane 1991). It is clonal and, although seedlings are produced, reproduction is primarily asexual (Crane 1991). Detailed information on this species is provided in the Fire Effects Information System database. Prostrate shrub with somewhat stoloniferous rooting stems, sometimes forming mats several meters wide; bark reddish to brownish, peeling off; stems ascending at the tip, 5-15 cm tall, minutely hairy, sometimes glandular. Alternate, evergreen, leathery, egg- to spoon-shaped, 1-3 cm long, 0.3-1.2 cm wide, rounded at tip, rarely pointed, narrowed basally, entire, glabrous to minutely hairy especially on the margins and midrib, dark green above, paler below; stalks 2-5 mm long. Several in few-flowered terminal clusters; flower stalks 2-5 mm long, straight or curved, borne in the axils of hairy bracts; corollas pinkish-white, urn-shaped, 4-6 mm long, 5-lobed; calyces 1-1.5 mm long. Berries, bright red, 5-10 mm wide. In 1974, Packer and Denford reviewed the classification of infraspecific taxa, found it to be inadequate, and proposed that four subspecies and two varieties be recognized. Two of the subspecies were new taxa, not previously described. The taxa were based on the type of hairiness found on the young branches and stalks, chromosome numbers, and phenolics. All four subspecies occur in BC, but are not geographically distinct. We have, therefore, decided not to recognize these taxa until further work is done on the taxonomy and distribution of these entities in BC. Dry forests and exposed, often rocky, sites in the lowland to lower alpine zones; common throughout BC; circumboreal, N to AK, E to NF and S to N CA, NM, MN, and VA; Eurasia. A shade-tolerant/intolerant, submontane to subalpine, circumpolar evergreen shrub (transcontinental in North America). Occurs on very dry to moderately dry, nitrogen­ poor soils (Mor humus forms) within boreal, temperate, and cool mesothermal climates; its occurrence increases with increasing continentality. Common in open-canopy, young­seral lodgepole pine forests on shallow soils, soils on rock outcrops and strongly drained coarse-skeletal soils on water­shedding sites. Often associ­ated with Gaultheria shallon, Pleurozium schreberi, and lichens. Characteristic of moisture-deficient sites. Arctostaphylos uva-ursi var. adenotricha Fernald & J.F. Macbr. Arctostaphylos uva-ursi var. coactilis Fernald & J.F. Macbr.